Brite_Hue_Recycled_Envelopes__Paper is rated 4.8 out of 5 by 203. Rated 4 out of 5 by Windsor from Good color, perfect for my Easter cards I’ve been a client forever when I lived in Manhattan, schlepped to whatever was your current address. So I am pleased that you are online. Rated 5 out of 5 by muralmouse from Perfect! JAMS paper had great customer service. I added the wrong shipping and they were quick to cancel my order so I could reorder with the correct shipping. My order came quick and the color was vibrant and the product was good quality; just as reflected on the site. I was very pleased with my order and it was just what I wanted for my greeting cards. Rated 5 out of 5 by DMaria from MISS BROWSING THE STORE Delivery was very fast. However, I miss browsing the store. I always found things I did not know I needed. Rated 5 out of 5 by erhod from Great features! Great products. One observation! I was looking for a little smaller size that can fit a standard size invitation and RSVPs Thank you for providing your services. Rated 5 out of 5 by Excited Mom from Orange they Perfect The envelopes are the orange that I was looking for. For the 9&quot; x 12&quot; OE Envelopes, can it actually hold a 9&quot; x 12&quot; print or is the inside area allowance slightly smaller? what does OE open end mean??. does it seal???? Open end means that it closes on the shorter side of the envelope (booklet means it opens on the long side). And yes, they have a gum closure. Thanks for the question! How much does 1,000 of these #10 Policy Envelopes weigh? They would weigh about 14 pounds. Are these envelopes self adhesive? &nbsp;Thanks! No they are not. They have a standard gum closure - licking or wet stamping required! I need bright red and gold (yellow) envelopes in various sizes. No clasps but should seal. OE means it doesn't have &quot;glue&quot; on flap? Open End just means that it opens on the shorter side. Our envelopes all come with a gum closure and will seal with moisture. WILL THIS ENVELOPE FIT A 5 X 7 FLAT CARD ? Our A7 Brite Hue Envelopes are the perfect fit! The closest PMS code to our green brite hue envelopes is 354U. I hope this helps! JAM lives by our slogan: EVERY color, EVERY size. Not only do we offer more than 20 envelope colors, we have over 30 envelope sizes! And that's not even counting all the paper and cover choices we have. Our colorful recycled paper and Brite Hue envelopes are the brightest, most influential, different colors in the industry! From those wedding invitations to those important business documents you need stored away, these colorful envelopes are what you want to use to stand out. Brighten up your mailing with Brite Hue Envelopes and your message will never go unseen. We have every size and style. From small coin envelopes to large-size clasp envelopes—we have it all! We even offered assorted color packs, so you can get all ours colors in one convenient package! 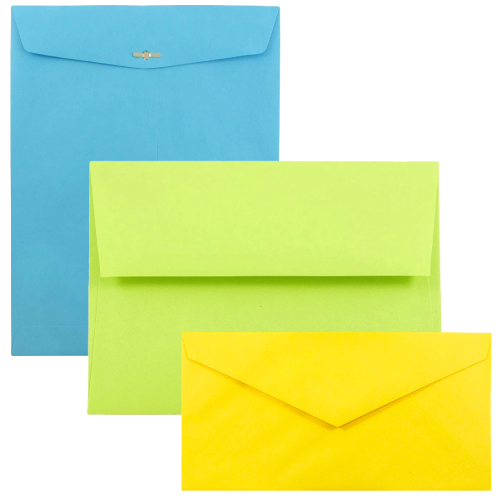 These acid free, archival envelopes are made from water soluble dyes; you are not getting these envelopes anywhere else. Most Brite Hue envelopes are recycled and made from 30% post consumer paper. Brite Hue 'Ultra' colors are not recycled. All of these colorful, brite hue envelopes and brite hue paper have matching 24lb and 65 lb Brite Hue Recycled Paper and 80 lb Brite Hue Recycled Cover. Buy colored envelopes today!